Doha, November 24, 2018 – Al Khalij Commercial Bank (al khaliji) P.Q.S.C., Qatar’s next generation bank, in its quest to expand the horizons of Qatar’s next generation, recently hosted an informative session on “Risk Management” for the students of Qatar University. The session offered insights into the nuances of managing financial risks and mitigating potential losses. The session comes as part of the bank’s efforts to provide comprehensive information to students and prepare them to manage risk in organizations. The session was hosted by Mr. Oliver Schwarzhaupt, Group Chief Risk Officer, al khaliji Bank, who discussed in detail the importance of risk management and offered ways to deal with financial crises. “Human capital has been given utmost importance in Qatar National Vision 2030 and we believe that once we nurture this immensely talented next generation with our experience & expertise, they have the mettle to truly catapult the financial landscape of Qatar through their wit & determination. This is what we intend to achieve by hosting such informative sessions, which are specially curated by our team of highly experienced people based on the current financial dynamics of Qatar. We are confident that through such sessions, our future leaders would gain tremendous knowledge to lead their future growth trajectory,” said Mr. Schwarzhaupt. The session was attended by Qatari University students in large numbers, who expressed their keenness towards interacting and discussing about the topics as well as gained insights about al khaliji as a leading financial institution in Qatar and its specialized offerings. Since its establishment in the 1970s, Qatar University has contributed significantly to the country’s resurgence. QU’s contributions are great, graduating more than 45,000 students that strive in achieving the vision of the nation. 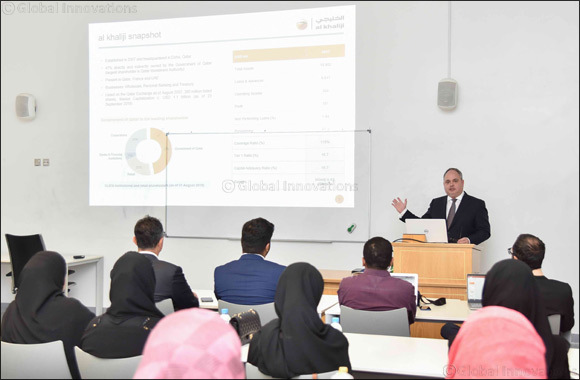 The Department of Finance and Economics at Qatar University is oriented toward addressing Qatar’s need for intellectuals and practitioners to serve the sustainable growth of its economy. Given the uniqueness of Qatar and the opportunities afforded by its resources, the mission of the Department is to provide and maintain prominent teaching and research in Economics and Finance and to offer rigorous programs focusing on relating theory to practice and addressing issues related to business, economic development and natural resource management.